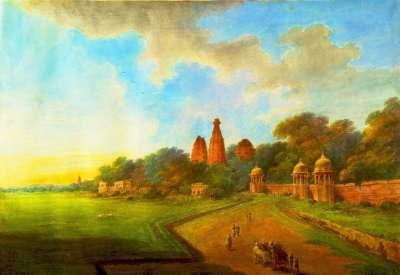 The painting style of India was not a realistic style using the European style of realism. That is the style where the artist attempts to draw or paint something exactly as it looks like. Instead the Indian artists didn't use perspective and painted 2 dimensional art not meant to look realistic. From their paintings we don't really get to see what India really looked like, they were stylists, not realists. Fortunately many Europeans artists travelled all over India and painted what they saw. Also at that time there were Indian artists who began to use the European style of realism in their paintings as well.